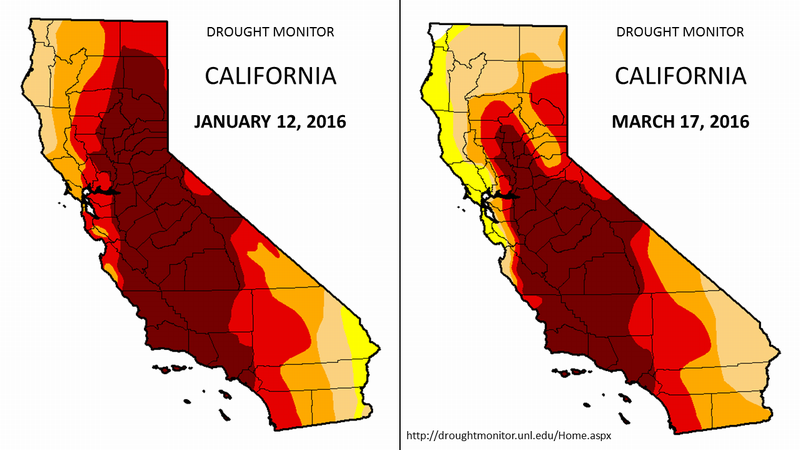 Yes, in the past two weeks there has been significant improvement to the drought impacting California. But there is still a long way to go. And in viewing the Drought Monitor, and other drought products, it should be kept in the context that one-size-does-not-fit-all to measure hydrologic imbalance in California. Defining drought in California is a conundrum of multi-faceted issues. One aspect is that drought impacts different users in very different ways and on very different time scales. While a local water district might fill all of its reservoirs and have a two-year reserve, another adjacent district might rely more on ground water and imported water and still have a deficit. Likewise, for some sectors of agriculture (the user of more that 75% of the water in the state) there might now be adequate supplies, the same is not true for a different crop. And an overarching parameter is that drought must also be viewed in the context of the complex California water supply and delivery infrastructure. Consequently, even though the bulk of this winter's has been in the northern half of the state there will be some reduction of impacts statewide. 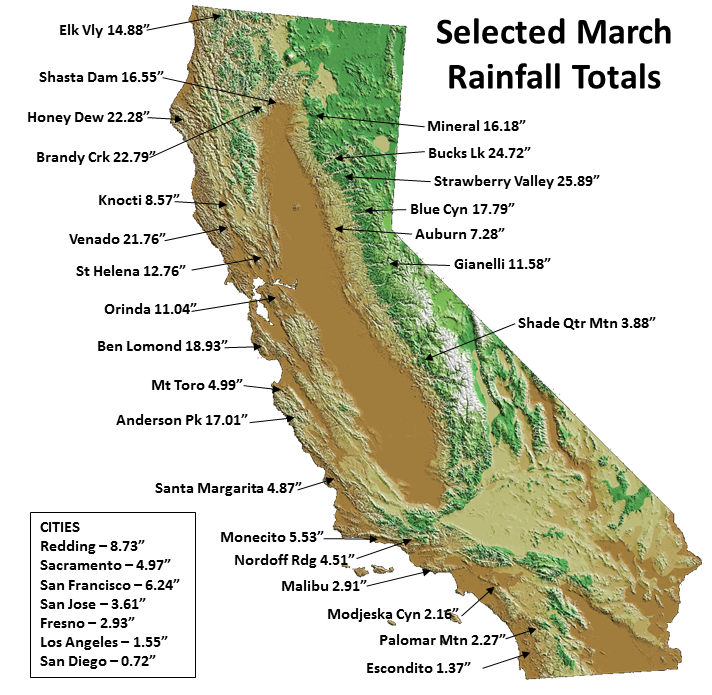 Watersheds in the northern half of the California made significant gains in first 13 days March. Over a dozen sites recorded in excess of 20 inches, with Strawberry Valley in the Northern Sierra Nevada topping the list (below) with almost 26". 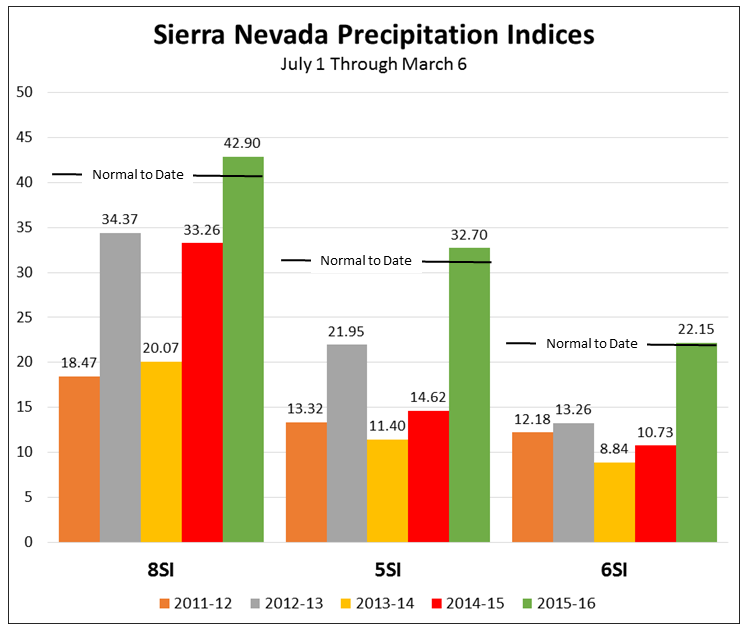 This pushed the Northern Sierra 8-Station Precipitation Index to 121% of normal. Accumulated 13-day precipitation totals in excess of 5 inches. 2015-2016 = 18.42" ...and counting. The rainfall through 6 pm has been 0.81", bringing the March total to 3.69", This is already higher than the March normal of 3.29"
With meteorological winter (Dec-Feb) at a close, it's always interesting to look back and see how well it was, or wasn't, forecast. Below is the 90-day outlook issued in November by the Climate Prediction Center along with the precipitation and temperatures anomalies that were actually occurred. My big takeaway is that the precipitation forecast was pretty much out of the "El Niño Playbook" and that this winter's El Niño impacts were atypical to say the least. 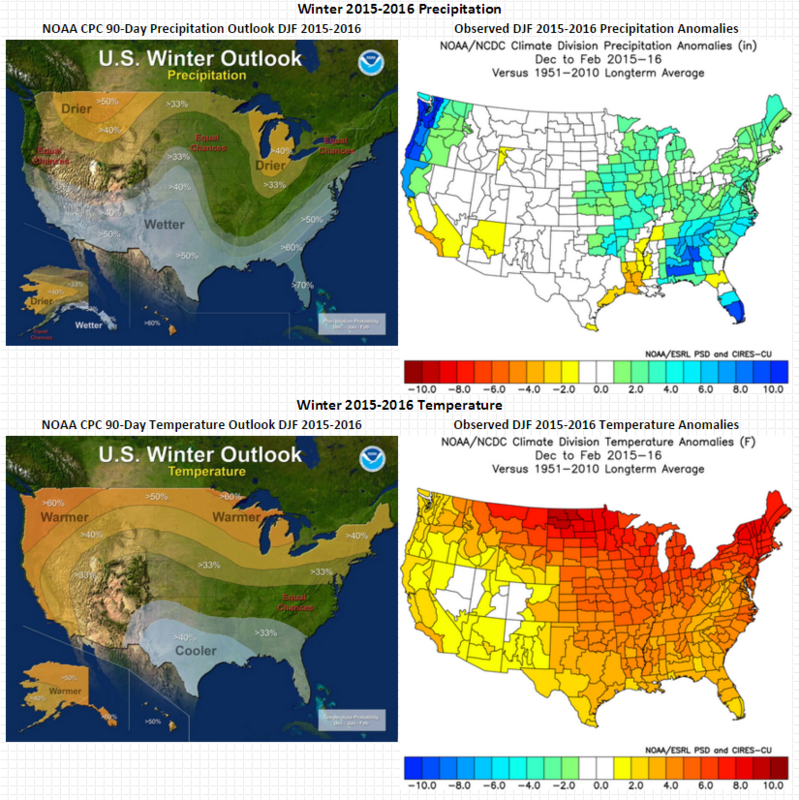 ( See El Niño 2015-16 becoming Poster Child for "All El Niños are not the same!") Consequently, most of the West Coast was 180 degrees out of phase with expectations along with the upper Midwest and Great Lakes. 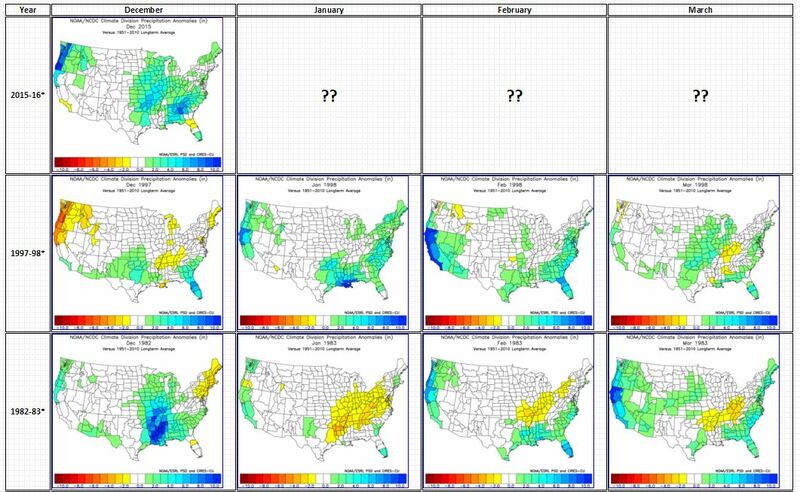 A more complete breakdown, including monthly forecasts, can be found at http://ggweather.com/cpc/2016/, and previous winters can be found at http://ggweather.com/links.html#research. Rain and snow in the past 72 hours across California have pushed precipitation amounts in the Sierra Nevada watersheds to above normal through March 6th. This the highest they have been on this date in five years. 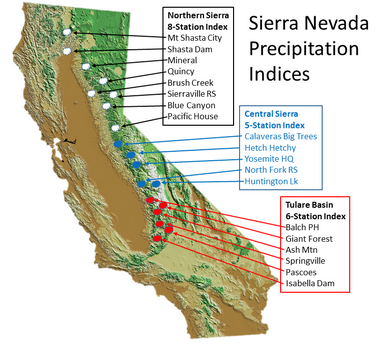 The Northern Sierra Nevada 8-Station index picked up over 6 inches of rain, while the Central Sierra 5-Station Index and the Tulare Basin 6-Station Index received 3.86 and 2.20 inches respectively. 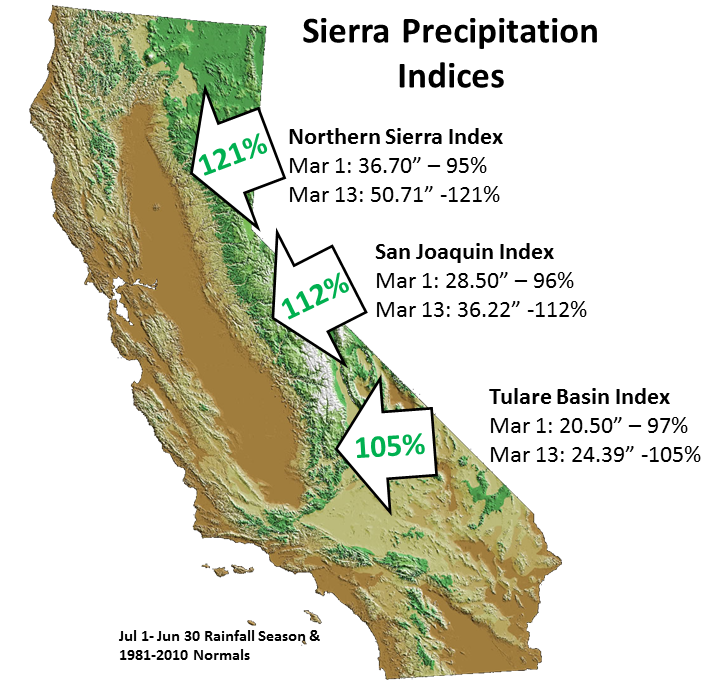 For the Northern Sierra this brings the rainfall season precipitation to date to 107% of normal, the Central Sierra to 106% and the Tulare Basin to 100%. Note: There will be a minor discrepancies between these figures and those published by Calif. DWR which uses the Oct. 1 Water Year instead of the historical rainfall season of July 1 to June 30. DWR also does not use the standard 30-year climatological normal (1981-2010) but rather non-standard average period of 1922-1998 for the 8-Station Index and 1961-2010 for the 5 and 6-Station Indices. Average maximum temperatures across California for February 2016 ranged from "just" well above normal (i.e., Eureka at +2.5 deg F) to downright toasty with average monthly maxima anomalies of between +6.1 and +9.4 degrees. Four of the eight major stations set records for all-time warmest maxima for the month. At the same time, rainfall across the Golden State was paltry at best, with values ranging mostly between 10 and 20% of normal. The exceptions were at opposite ends of the state with 58% of normal in Eureka and only 2% of normal in San Diego. 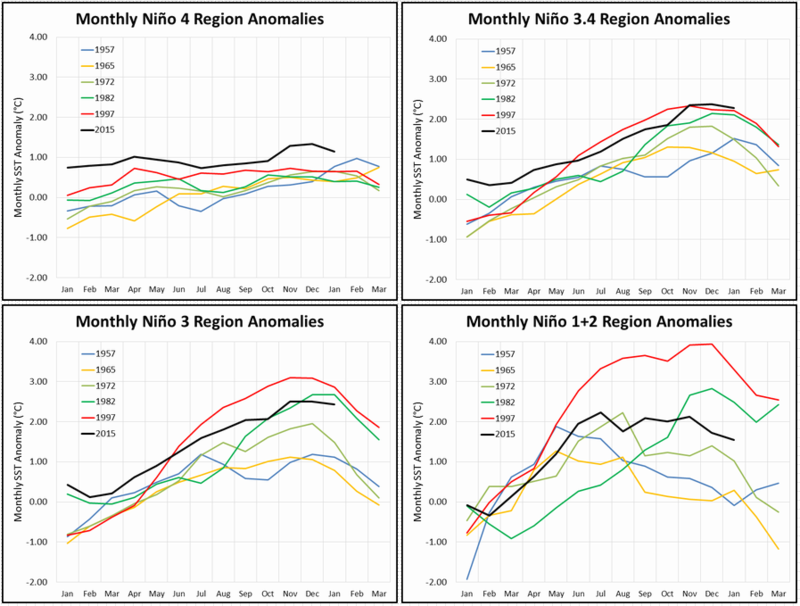 El Niño 2015-16 becoming Poster Child for "All El Niños are not the same!" Among the mantras from the past year by myself, SF State Professor Dr. John Monteverdi and many other responsible meteorologists, are that 1) each El Niño is unique, 2) the number of past events is statistically very small for comparison, and 3) that there are "no guarantees". To date many of the blogs, webpages and associated articles have look at the similarities to previous strong and very strong El Niño events. However, as the El Niño 2015-2016 and its impacts continue to unfold, Dr. Monteverdi and I felt it's important to look at how this year is dissimilar in many ways to previous events. To that end we have co-authored the following page: Differences Between 2015-16 El Niño and Previous Strong and Very Strong Events. Coming soon, will be a separate page with how the second half of the winter during these events has looked. The rainfall season- (July 1 to June 30) to-date totals and percentages of normal for 46 California stations are available at: http://ggweather.com/seasonal_rain.htm. What's Different with El Niño 2015-16? As we turn the corner into the second half of the rainfall season, it is becoming increasing apparent that the ongoing El Niño is becoming the poster child for "all El Niños are not alike!". 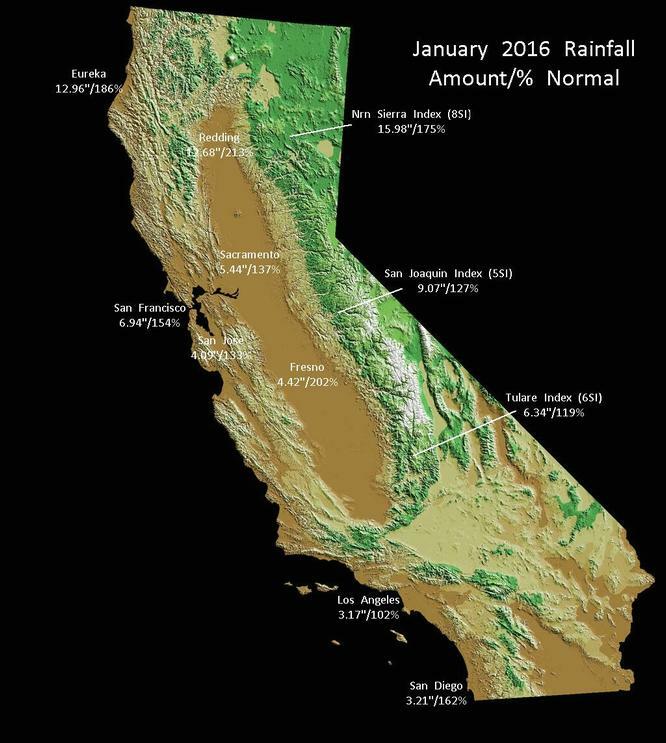 While it is still way too early to know what this will ultimately mean for California's rainfall season, it is noteworthy to look at some of the differences. 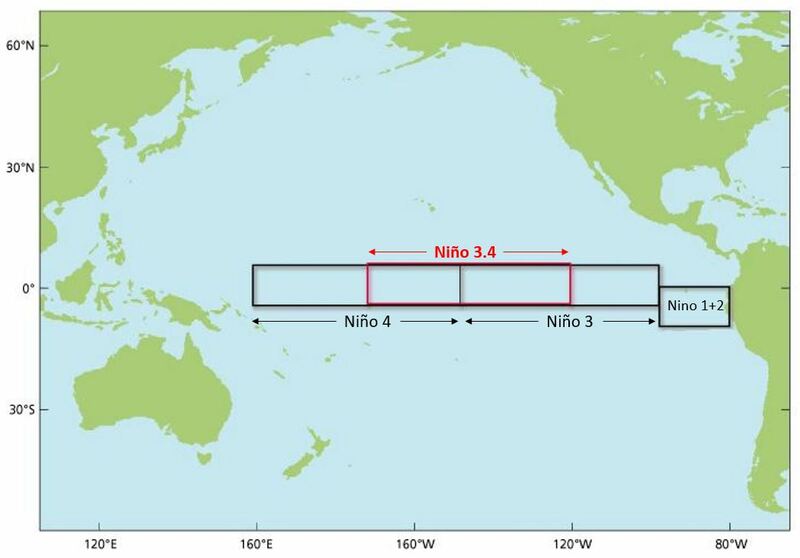 While most attention has been focused on the Niño 3.4 region (see map) which has been very similar to the very strong El Niño event of 1997-1998, there have been some significant differences in the adjacent regions. The Niño 4 region to the west alongthe equator has been warmer than 1997-98, while Niño 3 and Niño 1+2 regions have been cooler. There have also been significant differences in the monthly rainfall patterns compared to previous strong and very strong events. 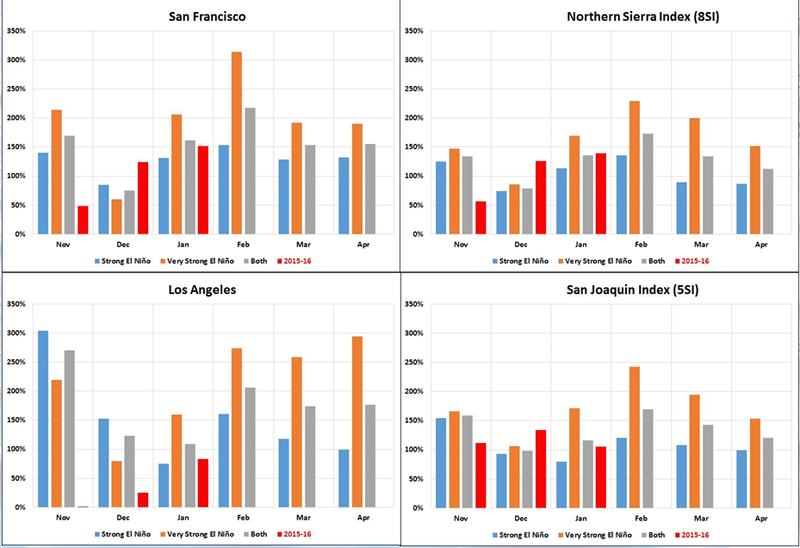 The following sample is for the San Francisco, Los Angeles, the Northern Sierra Nevada (8-station index) and the Central Sierra (5-station index), with monthly totals for November and December and for January through the 26th. Please insert the usual caveats, that it's still only the midpoint in the rainfall season and we don't know how these differences will impact the remainder of the rainy months. But it is different, so stay tuned. As the current very strong El Niño continues, it's time to examine how the current event looks in comparison to past similar strength events. The following is breakdown of the precipitation anomalies on a month-to-month basis for the previous strong (1957-58, 1965-66, 1972-73) and very strong (1982-83, 1997-98) El Niños. - December 2015 across the Pacific Coast states was almost a reverse image of the 1997 and there are really no good analog event for the West Coast. - Recent discussions have centered on Southern California being "left out" of the January mid-latitude storm track, but an examination shows that only in January 1983 was Southern California above normal. The full analysis can be found at http://ggweather.com/enso/strong/. 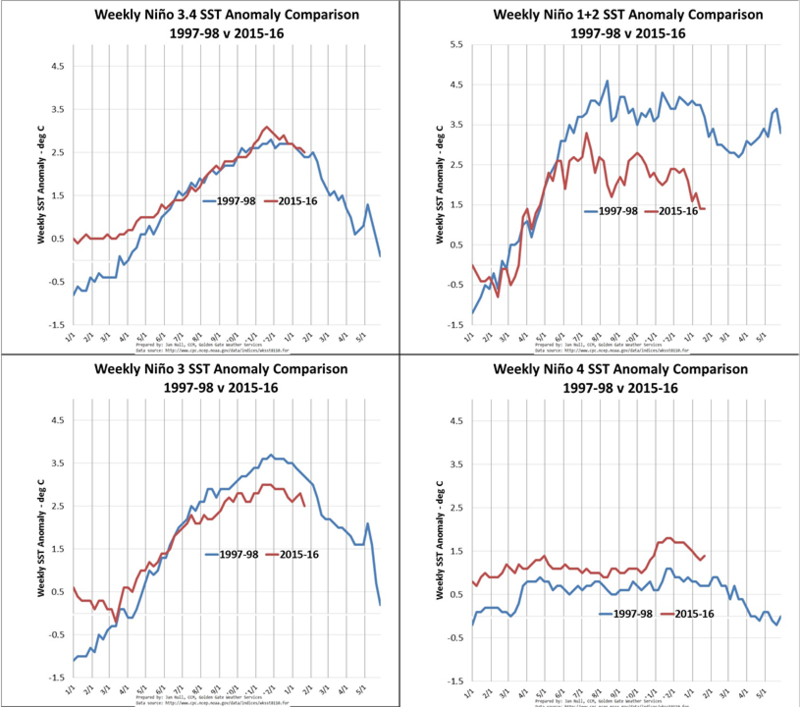 This page will be updated monthly through March as the each month's data becomes available. Send comments and questions to jnull@ggweather.com.